(Reuters) - Apple Inc on Tuesday posted its first-ever decline in iPhone sales and first revenue drop in more than a decade as the company credited with inventing the smartphone struggles with an increasingly saturated market. The company's sales dropped by more than a quarter in China, its most important market after the United States, and it also forecast another disappointing quarter for global revenues. Its shares fell about 8 percent, dropping below $100 for the first time since February. A hike in Apple's share buyback and dividend as well as bumper revenue from services failed to mollify investors. Apple said it sold 51.2 million iPhones in its second fiscal quarter, down from 61.2 million in the same quarter a year ago but above analysts' estimates of about 50 million devices. Apple was hard pressed to top sales from the year-ago quarter, which was boosted by the recent launch of a new generation of iPhones, Apple Chief Financial Officer Luca Maestri told Reuters in an interview. The phones featured larger screen sizes and sparked historic sales. 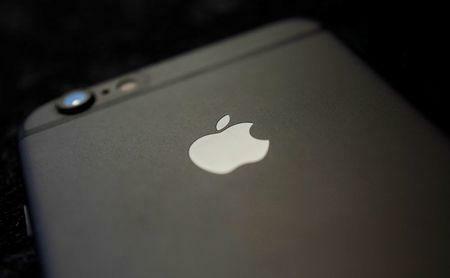 "The iPhone 6 is an anomaly, and so it creates a very difficult comparison for us," he said. After years of blockbuster sales, many investors fear the iPhone has reached saturation, spelling the end for Apple's exponential growth. The company has yet to present another device that can drive sales on that order, though last year it released the Apple Watch, its first new product without legendary co-founder Steve Jobs at the helm. "Apple is going to be put in a position, in a defensive position of how they show growth, and this is an area that Apple has not had to do for the last few years," said Patrick Moorhead, an analyst at Moor Insights & Strategy. Earnings of $1.90 per share fell short of the average analyst estimate of $2 per share, according to Thomson Reuters I/B/E/S. Revenue of $50.56 billion missed expectations of $51.97 billion. Apple forecast third-quarter revenue of $41 billion to $43 billion, short of the Wall Street consensus of $47.3 billion. In March, Apple released the iPhone SE, a smaller, 4-inch-screen phone featuring much of the company's latest technology. Although sales of the phone were not captured in the second quarter, the device is off to a strong start, particularly in emerging markets, Maestri said. "The situation right now around the world is that we are supply-constrained," he said. "The demand has been very, very strong." Although Apple's revenue in Greater China fell 26 percent from the year-ago quarter, Maestri stressed that the company's commitment to the market, its second largest, is unchanged. "We continue to be extremely optimistic about the Chinese market, and we continue to make a lot of investment there," he said. Rather than buying the iPhone 6S and 6S Plus, many consumers are waiting for the release of the expected iPhone 7 later this year to upgrade their phones, according to analysts. "The lengthening of the product cycle, that is how long people hold onto their phones, is going to continue to extend and that in turn impacts the overall smartphone market," said Bob O'Donnell, chief analyst at TECHnalysis Research. He said analyst forecasts on the smartphone market were too optimistic and predicted downward revisions after Apple's report. In reaction to Apple's results, shares of its suppliers Skyworks Solutions , Qorvo , Broadcom and NXP Semiconductors all fell 2 percent or more on Tuesday. Apple revenue from services such as its music service and Apple Pay mobile payments rose 20 percent to $6 billion. The drop in after-hours shares wipes out roughly $46 billion in market capitalization, roughly the value of heavy equipment maker Caterpillar Inc .